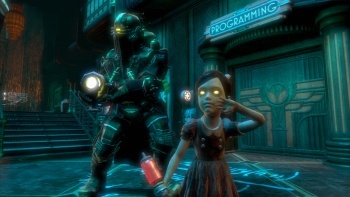 The Protector Trials DLC for the PC version of BioShock 2 made a surprise appearance on the Games for Windows Live Marketplace over the weekend, but don't bother rushing to get it because it doesn't actually work. If you're die-hard PC gamer like me, news that the Protector Trials turned up on the Games for Windows Live Marketplace a few days ago will probably elicit some pretty excited responses. Like, "What? Didn't that come out last year? Or wait, I heard they canceled it. Didn't they cancel it? Jeez, I uninstalled that thing last summer." Well no, it hasn't been canceled (actually it was, but 2K uncanceled it in October 2010), work is progressing and we'll have access to it at some point in the presumably-near future. It's not quite ready for prime time yet, however, as evidenced by the experience of those who managed to snag it during its brief, unannounced run on GFWL Marketplace. Long story short, it didn't work, which caused much chagrin among gamers who spent 400 Microsoft Points on it despite 2K saying in October that it would be free when it finally came out. And it still doesn't work, and won't for awhile yet. "Wait till my word before you go grab it - it's not ready yet," 2K Games Marketing Manager Elizabeth Tobey wrote on the BioShock 2 forums. She gave no hint about when it would be ready but added in another message that there won't be an update on the situation until at least Tuesday. I certainly don't want to belittle 2K's commitment to the PC but with more than a year gone since the launch of BioShock 2, and six months since the Protector Trials came out for the Xbox 360 and PlayStation 3, I do have to wonder if anyone actually cares about this anymore. A delay of a few weeks is one thing, but half a year? That's a bit much.